If you've spent much time around this blog, you know that I'm always finding a way to write about food. 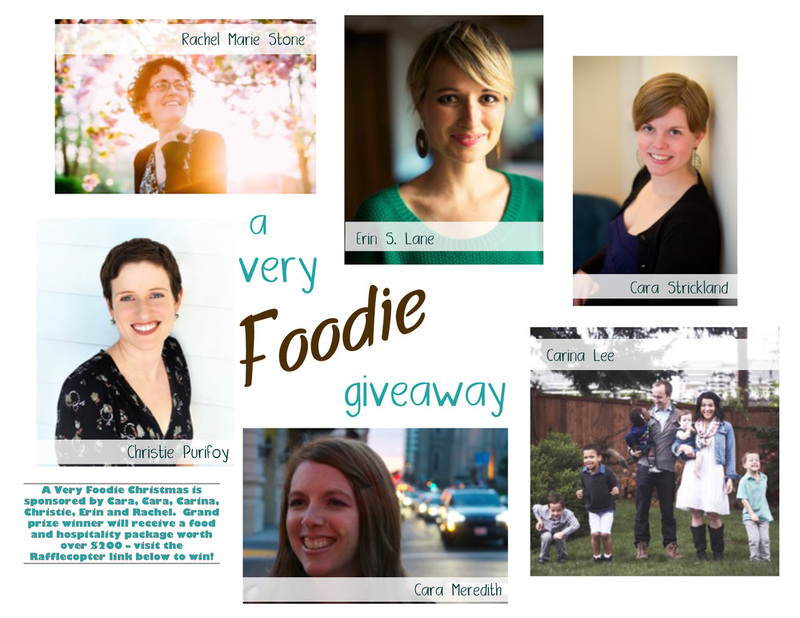 Today I'm thrilled to be part of a foodie themed giveaway with some of my favorite writers (and a new friend). We've all chosen food-related gifts to give away, and one lucky winner will win it all! I've chosen to give away Ruth Reichl's book Garlic and Sapphires (which is about her time as a food critic for the New York Times, and one of the first things I read as a new food critic), and a set of two black and white polka-dotted Rikon knives (one of the only kitchen things this anxious cook uses every day). If you're unfamiliar with these authors, I think you'll be in for a joyous surprise. These women are beautiful writers. Feel free to click on the pictures below to get a better look! Here is the whole giveaway package. Cara Meredith is a writer, speaker and musician from the greater San Francisco bay area. She is passionate about theology and books, her family, meals around the table, and finding Beauty in the most unlikely of places. A seven on the Enneagram, she also can’t help but try to laugh and smile at the ordinary everyday. You can connect with her on her blog, Facebook, and Twitter. (You might remember her de(tale) about her grandma's piano). Christie Purifoy earned a PhD in English literature at the University of Chicago before trading the classroom for an old farmhouse and a garden in southeastern Pennsylvania. Her first book is forthcoming from Revell.You can connect with her on her blog, Facebook, and Twitter. (You may remember her from her de(tale about bread). Erin S. Lane is author of Lessons in Belonging from a Church-Going Commitment Phobe (forthcoming, February 2015) and co-editor of Talking Taboo, an anthology of writing by young Christian women on the intersection of faith and gender. Confirmed Catholic, raised Charismatic, and married to a Methodist, she blogs about faith, feminism, and, yes, cupcakes on her blog, Holy Hellions. You can also connect with her on Twitter. (You may recognize her from her de(tale) telling the story behind her tattoo). Rachel Marie Stone is a writer living near Philadelphia. In the past eight years, she has lived in four countries and two states, and will gladly tell you about the various kinds of pizza she ate (or didn't eat) in each place. Her book, Eat With Joy, won the Christianity Today Book Award for Christian Living. You can connect with her further on her blog, Twitter, and Facebook. (You may remember her beautiful de(tale) about finally unpacking her dishes, and my review of her book). Carina is an etsy shop owner, writes when she can, works with Noonday to advocate for women around the world, and loves food. Preparing it, consuming it, sitting together around a table filled with friends and family enjoying it. She lives in Seattle, WA with her five lively children and one awesome husband, and drinks way too much coffee. You can connect with her on her blog, etsy shop, and Instagram (among other places). If you're reading this through email or a reader, you'll need to click over to enter. I think you'll find it worth your while. In case you hadn’t heard, I am getting ready to launch a new newsletter this month. If you would like to sign up for it (or for blog emails) you can do so here.